Traditionally, a wedding guest book would be placed by the entrance to a couple’s venue for all their guests to write their names confirming their attendance. It’s simple and easy, yes, but boring. Who actually pulls out their wedding guest book ten, twenty, fifty years later to have a looksie at who came to celebrate with them? Nowadays, couples are opting for more unique, fun, and personalized ways to keep track of who attended their special day. Our favorite was the “tip” jar we posted about earlier this week for bridal tip Tuesday. Having the people that attended your wedding, the ones you love the most, and would likely go to for advice anyway, write down marriage “tips” and put them in a jar is GENIUS! It allows your guests to get a little more personal with you and makes them feel like they’re contributing to the success of your marriage in some way; it’s also likely saving you a phone call six months from now when the honeymoon stage wears off. Nevertheless, there are thousands of wedding guest book alternatives out there now! Here are a few we liked, in addition to the “tip” jar! 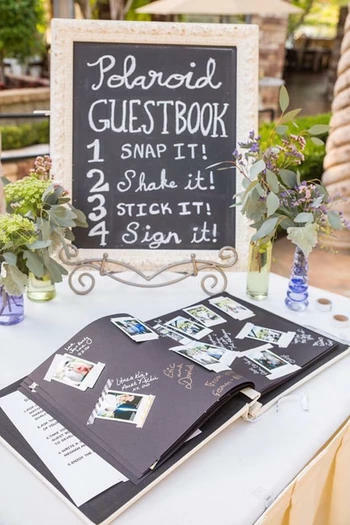 “Snap it, shake it, stick it, sign it.” These Polaroid guest books keep it traditional with the “book” and signatures aspects, while kicking it up a notch with actual pictures of your guests taken by your guests! Beware though, you never know what you’re going to get when your guests start taking pictures of themselves! These are really neat in that your guests help you create a piece of artwork that will likely hang in your new household. The premise is to have your guests ink their thumbs, then stamp the artwork, leaving behind their thumbprint and signature! So creative! FYI, the prints that are bit smeared likely belong to your party animals! With this alternative, you have your guests sign small wooden hearts and slide them in the opening of a shadowbox. The hearts collect in the shadowbox, building on top of each other, creating a 3-D artwork effect. You’re able to clearly see the names of your guests through the shadowbox display! Keep in mind to set time aside!